Harbour View – On June 14, 2013, His Excellency the Governor of Sint Maarten, drs. E.B. Holiday, officiated the appointment and administered the oath of office to the Ministers and the Minister Plenipotentiary of the new cabinet. Mrs. Sarah A. Wescot-Williams will also act as Minister of Tourism, Economic Affairs, Transport and Telecommunication temporarily. In the UP/DP Governing Accord, integrity, transparency, reduction of bureaucracy and efficiency and service have been specified as focal points for the remaining governing term. 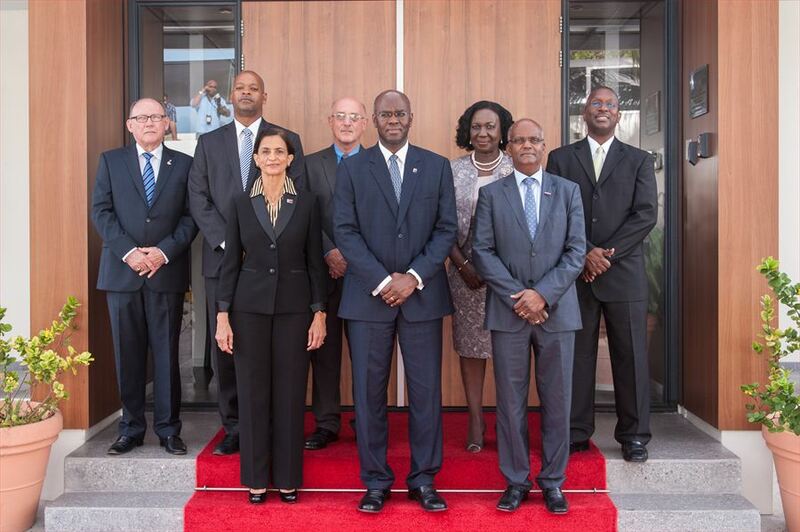 Together with economic diversification, fiscal reform and simplification, social safety nets, job creation, training, poverty alleviation, community and infrastructural development, legislative focus, electoral, labour and immigration reform, national insurance and the completion of the reorganization of the Justice Ministry as focal issues for Sint Maarten, the governing accord will be executed as agreed upon by the coalition partners United Peoples Party, Democratic Party and the independent Member of Parliament Romain Laville. “You have just witnessed the transfer of executive responsibility for the governance of our island Sint Maarten from one team of ministers to a new team of ministers. A new team of ministers that was presented to me thanks to the work of formateur Ms. Wescot Williams following a path which was not without challenges. En route to the transfer, the strength and resolve of our nation has been put to the test. And a new chapter has been written in the constitutional history of our young nation and parliamentary democracy. • And the third ideal being our declaration that we wish to create a constitutional order based on an open and approachable government. As a result we have no option but to work towards these ideals, as anything else will go against the general interest, that is against the interest of the people of Sint Maarten. In monitoring recent political developments and looking ahead I am concerned about the increased divisiveness and accusations as well as about the increasing questions about this nations commitment towards mentioned ideals. Let me in that regard say that, I am sure, that is not what the people of Sint Maarten want. I say this, because of my firm belief in the good of the people of Sint Maarten and because I am particularly pleased and encouraged to see the increased level of involvement of and debate among the people of Sint Maarten regarding political developments during the past weeks. I therefore challenge you as the new team of ministers, as you assume your mandate to govern this beautiful country, to make the further building on the realization of our ideals your priority. Accepting the function of minister through the taking of the oath today, is a solemn expression of your commitment to perform your function with integrity. It is your pledge of allegiance to the King and the Kingdom Charter and it is your individual declaration to always uphold the Constitution of Sint Maarten and to always dedicate yourself to foster the wellbeing of the People of Sint Maarten. In that regard, there rests on you individually as ministers and jointly as Council of Ministers a great responsibility. Through your oath, you have accepted the obligation to serve all the people of Sint Maarten. This based on the principles of democracy, on the rule of law, …… and on respect for the fundamental rights and freedoms of all persons and anchored in our determination as a people to work together. It is my hope and trust, that as you continue the march where your predecessors left off, that you will, through the application of the principles of good governance, answer the call to unite the people towards the further overall and balanced development of our island nation. This hope and trust comes from my firm belief in the good within and strength of the Sint Maarten people. With that in mind, I hereby congratulate the people of Sint Maarten with the installation of this new government and similarly congratulate each of you individually and jointly with your appointments as Prime-Minister, Ministers and Minister Plenipotentiary.